I don’t play many video games. My work time is spent in front of a screen, and I use a computer a lot at home, too (to write this blog, for example!). I’m more of a fan of traditional games — card games, board games, tabletop role playing games. I always raise an eyebrow when YouTube suggests “gamer” content to me, because nine times out of 10 it’s “Minecraft” or “Fortnite” or something. Those are games, but not my kind of games. I think the problem I have with video games, besides screen time, is the options: there’s just too many things to keep track of at once. Take a classic video game, “Space Invaders.” There’s two options: move and shoot, and move is limited to left/right. Very simple. Move to the later generations of games, and we have two buttons on the NES controller, six (I think) on the Genesis, and after that I lose track (10 or so on a modern controller?). 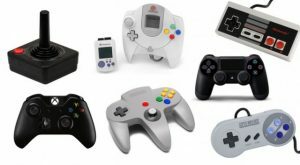 With a first person shooter-type game, you have weapons and abilities to scroll through, a heads-up display, maps, hit point tracks, and several other things on every screen. A game like that is still a lot of fun to play — but it’s a lot more fun if you can keep track of everything, to make use of it the way it’s meant to be used. I could learn that, if I put in the screen time, but I’d rather bring the concept to a game I already enjoy… Domino Writing-style USR. The ancestor of a first person shooter with its dozens of things to track is of course our favorite tabletop role playing games, where you mark all the things you need to track on a sheet of paper instead of letting a computer do everything for you. But USR is on the other end of the spectrum, a simple system that gets players up and running in no time. Instead of a list of a dozen abilities, USR offers bonuses that can be used any way a player wants. I call them Free-Form Specialisms, though they’re not really Specialisms; they aren’t even recorded on a character sheet! A beginning character doesn’t select three Specialisms, each with a +2 bonus; instead, the character begins with 6 “+1s” to spend on any roll you wish. The bonuses can be added to any roll, before or after the die is rolled. Any number of bonuses can be added to the same roll. A character regains all his or her “+1s” at the beginning of every game session, but can never go above 6. If a player decides on a Specialism for his or her character, the Specialism is written on the character sheet, with a +2 bonus (for a starting hero). In return for choosing a Specialism, the character immediately loses two “+1s.” So a character with a single Specialism would have a +2 in the Specialism and four “+1s” to spend during the adventure. Free-Form Specialisms are a little like Narrative Points, but they’re more specific, and represent a character’s wide range of knowledge and expertise, rather than his or her capability to change the story. They’re mainly to get the game started even more quickly — all a player has to do now is decide which stat gets which die, and spend Combat Gear points — or to help players who want to see how their character develops over time. 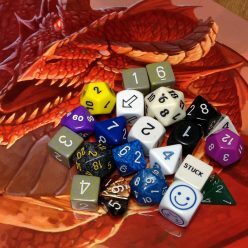 Free-Form Specialisms are things your character can do well: things you don’t have to specifically keep track of, things that let you do whatever you need to do to have the most fun you can in the game. All without staring at a screen.